Anyone who decides to live life outside God is setting himself or herself up for disaster. God is the essence of our living and staying connected to Him is the way to go. In Him we live, move and have our being. You cannot detach yourself from life and expect to live. This fact is the foundation upon which the truths in this book are built. The Beautiful Branch is a great effort in placing women on the right track right from the foundation. Provisions have been made for every aspect of your life in this power packed book. Freedom is all about knowing the truth, accepting the reality of that knowledge and combining the two to fulfilling God’s purpose for your life. Every single word in this book has been delicately put down through the inspiration of the Holy Spirit to open your eyes to the revelation of God’s mind for you. On the pages of The Beautiful Branch you will discover how to become the kind of woman that God wants you to be- A beautiful woman. This book will take you through what it means to have a beautiful spirit, career and appearance, be a beautiful single or wife and mother and encourage you to live to fulfil God’s purpose for your life by bearing beautiful fruits. God wants you to be a total package of beauty and this book will show you how you can achieve that desire of God for you. This book is filled with wise, practical, well illustrated, simple and proven principles that makes the reader to ask. . . How can I be beautiful, God’s way? And you wouldn’t have to look faraway for the answers because they are right on the pages of this book. If you desire to be beautiful in every aspect of your life, read, study and meditate upon the awesome revelations in this book. Open your heart to receive the truths therein and see your life revolutionize. 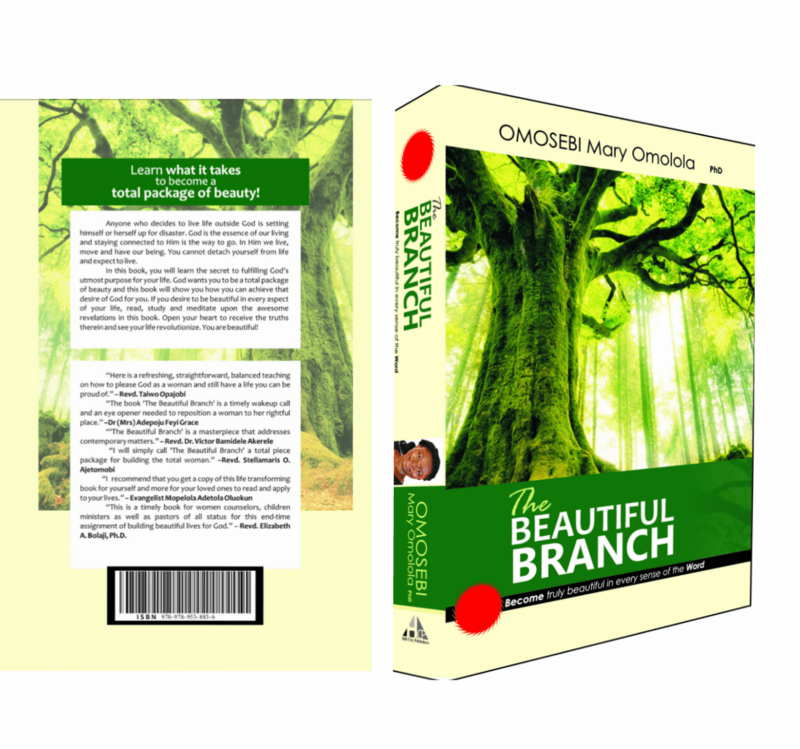 After payment, send an email to thebeautifulbranch@gmail.com or call +2348158867545 to supply details of your location, number of copies paid for, telephone number and postal address (for the Hardcopy). Make a wire transfer of $17 for the Hardcopy (postage fee included). I strongly recommend that you get this book, read it rapidly to grasp its strategy, read it thoughtfully to understand its principles and read it intentionally to put its strategic principles to use. The end result of knowing the truths contained here will certainly be that you become a beautiful branch in the Vine and that of course is what you are destined to be. University Baptist Church, Ogbomoso, Oyo State, Nigeria. The writer points to the fact that whatever one does in life must have biblical backing. This book covers issues of private and public lifestyle. She is of the opinion that one cannot claim to be a Christian and not live right in his or her relationship with people. The writer adopted a writing style that makes it easy for readers to understand, assimilate and remember the content of each chapter. The word “Beautiful” is common to all the chapters. This word aligns with the title of the book. The word “Beautiful” also fits the major audience that this book addresses, which are females. However, its applicability fits the males too. Also, one of the beauties of this book is that the chapters are beautifully knitted together into one book, titled- The Beautiful Branch. I welcome you into a fruitful journey as you read this book. FBC Festac Town, Lagos, Nigeria. I will simply call The Beautiful Branch a total piece package to meet the total woman. Every woman should have it, read it and pass it on to others. The Beautiful Branch is a great effort in placing women on the right track right from the foundation. The author did a very good work and gave very practicable advise for making women beautiful at every stage that a woman must pass through in life: singlehood, marriage, motherhood, career, etc. I am really thrilled about her section on making the single period as well as the career period beautiful. Sealing it all with godly women’s appearance is really commendable. This is a book for every “female-man” of every age and a timely book for women counsellors, children ministers as well as pastors of all status for this end – time assignment of building beautiful lives for God. Revd’ Elizabeth A. Bolaji, Ph D.
Baptist College of Theology, Oyo, Nigeria. The Beautiful Branch is laden with profound and practical teachings. On these pages you will discover how to become the kind of woman that God wants you to be. This book is filled with wise, practical, well illustrated, simple and proven principles that makes the reader to ask. . . How can I be beautiful, God’s way? And you wouldn’t have to look faraway for the answers because they are right on the pages of this book. This book will inspire you to fulfill your role as a woman at every phase of life. If you desire to be a balanced woman, this book is for you. I highly recommend this inspired, informative and instructive book to all. It is a must read for every woman. So… I finished The Beautiful Branch. I don’t even know how to describe the book but I will try with these words-wonderful, amazing, real, simple and practical. Wow! That’s just one of the many amazing truths I discovered in this book. I’ve been so blessed. Please fill the contact form at the bottom of the page to send your delivery details (postal address and phone number) once your payment goes through.